At first sight, Repps is a large and rather ordinary village in the heart of the Norfolk Broads - but this is in itself an unusual thing, of course, and suggests that here is a village of ordinary Norfolk people leading ordinary Norfolk lives, which comes as something of a relief after to the tourist clamour of Wroxham and Hoveton. The church is set a little way out of the village, down towards the river, but is open every day, as they virtually all seem to be in the Broads (except for nearby Potter Heigham, where the eccentric churchwarden 'likes to know who's going into his church'). The parish has been a joint one with neighbouring Bastwick for centuries. 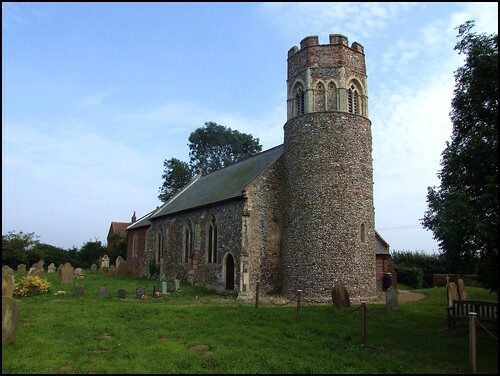 The former Bastwick church tower still stands near the road to Ludham, proclaiming itself, somewhat surreally, a 'Cats Hotel'. The flint tower of St Peter, with its13th Century bell stage crown, is a handsome one, and the red brick south porch offsets it nicely. Externally, this is still a pretty and rustic medieval church, but the interior is almost entirely the work of the 1890s. In fact, this is not a bad decade for church restorations; the heavy-handed enthusiasms of the previous few decades were now frowned upon, and the Church of England had not yet reached that mawkish apotheosis which the years immediately after the First World War would bring. You step into a simple, lightly furnished space, with steps mounting into the chancel beyond the chancel arch. Turning back, the west end is plain and unadorned, a fitting setting for the font. It felt very loved and looked after. Best of all, I liked a pretty survival of the early 20th Century, the banner carried by the St Peter's Sunday School when processions were still a regular feature of the life of the Church of England.